Barcelona vs Manchester United, Champions League Quarter-Final Live Streaming Online: How to Get UEFA CL 2018–19 Leg 2 of 2 Match Live Telecast on TV & Free Football Score Updates in Indian Time? With 1-0 lead, Barcelona are in a pole position to qualify to the semi-finals of the 2018/19 UEFA Champions League as an out of from Manchester United come visiting the Camp Nou on April 17 (as per India time). The Red Devils lost the first leg to a Luke Shaw own goal, and although they have managed a miracle at PSG before, Barcelona just do not lose at home. Ole Gunnar Solskjaer has looked confident in the pre-game build-up stating his squad has the capability to overcome the deficit but knows it is going to take an exceptional effort. After struggling to make it big in Europe for several seasons, Barcelona are determined to be Champions again hence will be cautious in approach. If you are searching for live streaming online, free live telecast, free football score updates in Indian time (IST) of Barcelona vs Manchester United, Champions League Quarter-Final Leg 2 of 2 match, you are on the right page. You will find all the match-related information here. Barcelona vs Manchester United - Live Football Score Updates. Nemanja Matic and Alexis Sanchez are both fit again and are part of the travelling group for Manchester United though both are short of match fitness. Fred and Scott McCtominay have showed their potential in the last two games and are in line for a start at Camp Nou. Anthony Martial, Juan Mata and Jesse Lingard did not have the best of games against West Ham United, but one out of these three will start again. With Luke Shaw suspended, Diego Dalot will take his position with a tough job of marking Lionel Messi and co. Manchester United’s Alexis Sanchez in Surprise Contention for Barcelona Clash. Lionel Messi is fit to face the Red Devils after a strong challenge by Chris Smalling left him bleeding in the Old Trafford game. Ousmane Dembele showed ill-effects of his long term injury in the game against Huesca and hence could drop back to the bench. The key man in defence is Gerard Pique who used all his experience to shut out any Manchester United attack in the first leg. He is likely to partner Clement Lenglet who is error prone despite being very calm and assuring on the ball. When is Barcelona vs Manchester United, Champions League 2018-19 Quarter-Final Leg 2 of 2 Football Match Schedule (Date, Time and Venue Details)? Manchester United will be travelling to Barcelona for the Leg 2 match of UEFA Champions League 2018-19 Quarter-Final on April 17, 2019 (Wednesday as per Indian time). The mouth-watering clash will take place at Camp Nou, Stadium in Barcelona, Spain with Barcelona vs Manchester United kick-off time being 12:30 am IST. 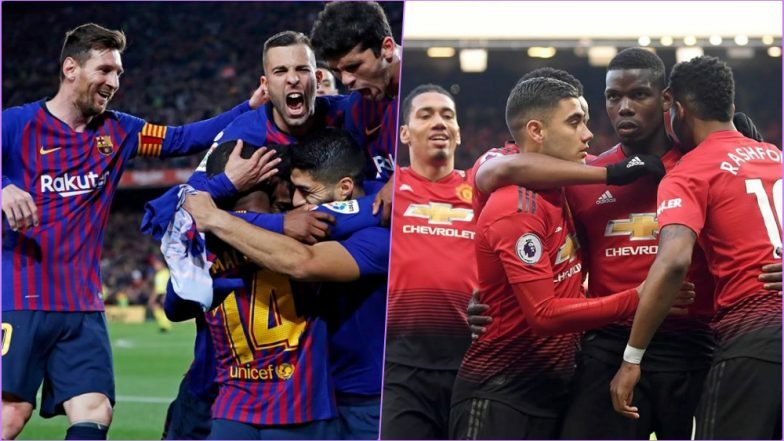 How to Watch Live Telecast of Barcelona vs Manchester United, Champions League 2018-19 Quarter-Final Leg 2 of 2 Football Match? The live telecast of Barcelona vs Manchester United will be exclusively available on Sony Ten 1, Sony Ten 2, or Sony ESPN channels. It is going to be an exciting game as the English side take on Spanish giants in front of their home crowd! Where to Get Free Live Streaming Online of Barcelona vs Manchester United, Champions League 2018-19 Quarter-Final Leg 2 of 2 Football Match? With Sony Sports Network as the official broadcaster, their digital platform Sony Liv will be providing the free video streaming. You can catch Barcelona vs Manchester United, tie of UEFA Champions League with free live streaming online on Sony Liv. Live score updates of Barcelona vs Manchester United, will be available on LatestLY here. Manchester United could make a real contest if they get an early goal, but given the poor form of their attackers, it looks highly unlikely. Barcelona will go through where they have a potential semi-final clash with Liverpool.